In his latest adventure, the endearing private investigator of Dover Beach and The Distance Beacons finds more danger and mystery in a crippled post-nuclear Boston. This time he is brought in to investigate the strange disappearance of Flynn Dobler, the charismatic leader of the Church of the New Beginning. Is it murder – or a miracle? Meanwhile, the governor of New England wants Walter to follow the head of a Federal delegation negotiating a vital treaty with the struggling new country. Is he fomenting a revolution in his spare time? Or could there be another explanation for his nightly visits to the dangerous urban wasteland of nearby Somerville? Before long, both cases put Walter’s life at risk. And, as usual, he encounters a host of memorable characters, including many familiar faces from his earlier adventures. 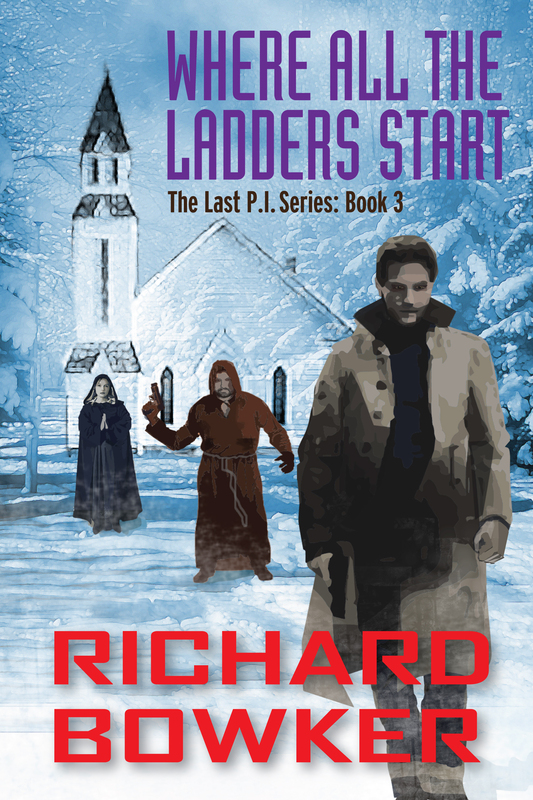 Exciting, funny, and thought-provoking, Where All the Ladders Start is a memorable addition to The Last P.I. series. Fantastic series, rich characters, read this, read the whole series! It may seem like hyperbole but I LOVE the characters and ideas that roam the world they are set in, and so should you. give this a try! I got off my bike and stared at the guy in the brown robe. The guy in the brown robe stared at me. He was sitting at the front of a cart piled high with apples, pumpkins, squash, and other fall produce; half a dozen dead turkeys hung from hooks at the back of the cart. He was big and broad and scary, with small black eyes, long stringy hair, and a scraggly beard that was interrupted by a deep scar on his left cheek. “Hiya,” I said, trying to break the ice. He stared at me for a second, and then his eyes moved to the horse, who ignored him. The guy didn’t respond. I hadn’t really expected him to be looking for me. But Lower Washington Street was an odd place to park a cart filled with food. He didn’t look like he was interested in nice days. Fine. The world was filled with strange people, and he was just one more of them. I walked around the cart and entered the building that housed my spacious, well-appointed office. Okay, those adjectives aren’t entirely accurate, but the place fits my needs, which mainly consist of a stove to keep me warm and shelves to hold the books I read to pass the time while I wait for clients to show up. Also, a desk and a couple of chairs in case a client actually does show up. Not that this had been happening much lately. Or, well, ever. I carried my bike inside and walked upstairs. From the hallway, I noticed that the door to my office was open. I always close the door to my office when I leave at night. Of course, the door doesn’t lock, but that doesn’t really matter. Nothing worth stealing in my office. I took out my gun. I wasn’t especially worried, but it pays to be careful. “Please don’t do anything stupid,” I announced, and then I went inside. And there, sitting by my desk, was the most beautiful woman in the world. She was wearing a powder-blue robe, and she was staring at me. It was impossible to forget her. “Of course,” I said. “Sister Marva. How are you? And please, call me Walter.” We had met during one of the many disastrous episodes in my previous case. She was a disciple in the Church of the New Beginning up in Concord. Long black hair, creamy white skin, deep blue eyes. I found it hard to break my gaze away from those eyes. I sat down behind my desk, and that’s when I noticed that she was pregnant. Well, that was interesting. Beautiful pregnant woman shows up in the private eye’s office, needing his help. That’s the way it’s supposed to happen. “You almost killed Brother Flynn,” she reminded me. “Yes. I’m very sorry about that.” Flynn Dobler was the leader of Sister Marva’s Church. A very smart, charismatic fellow. I snuck into the Church in the middle of the night and pointed a gun at him while he lay in bed. I remembered Marva coming in and leaping on top of him, desperate to protect her master from the intruder. All because of a really stupid theory I’d come up with about a kidnapping I was investigating. This had not been my finest moment as a private eye. “Brother Flynn has disappeared,” she said, and the smile faded, and her beautiful blue eyes filled with tears. “A week ago. He was there one night in his room, and then—in the morning—he was gone.” The tears started falling down her cheeks. This was the way it always happened in the novels I’d read. And now it was happening to me. But this didn’t feel like a novel—this was a real human being, shedding real tears. I wanted to comfort her, but I also needed to do my job. She shook her head. She wiped her cheeks with the sleeve of her robe. I wished I had a handkerchief to offer her. In my novels, the private eye always had a handkerchief. Sister Marva lowered her eyes. “Brother Joseph does,” she murmured. “Sister Lucy saw Brother Flynn get taken up to heaven,” I said, making sure I had this straight. She smiled and inclined her head. “It’s a blessing.” Her smile made you happy to be alive. Her face clouded and she looked down at her belly. “I don’t think—I don’t think that has anything to do with Brother Flynn’s disappearance, Walter.” she replied. And then she fell silent. That wasn’t a bad idea. Inflation was getting to be a problem. Who knew what the money would buy when I got around to spending it? “Food would be fine,” I replied. We went back down to the street, where Brother Reggie did not in fact seem to be tired of waiting. It wasn’t clear that he had even moved since the last time I set eyes on him. But his face lit up when he saw Sister Marva, like a dog greeting his master. Marva and I agreed to meet at the Food Market later. I filled a bag with produce from the cart and grabbed one of the turkeys. Looked like ten dollars’ worth to me, and Marva didn’t haggle. Then Brother Reggie helped her up onto the cart, and they headed off. I watched them go. The Church of the New Beginning. Leave the past behind, it preached. Start fresh—no technology, no government, none of the baggage that still weighed so many of us down. Look at where all that stuff had led us. Reasonable enough, I supposed. The past had certainly ended up badly. But now, strangely, the Church had a missing-person case on its hands, and it had decided to call on that useless relic of the past, a private eye. Well, I had already seen some strange things in my brief career; no reason for this case to be any different. Off on a case! Won’t be back today, but I will be back tomorrow. There, that would intrigue them. I left the note beside the produce, and I headed off to the Food Market, munching one of Marva’s apples.